Galleri Feldt were at CHART DESIGN at Den Frie gallery in Copenhagen with a fascinating show of the display system designed by Poul Cadovius in 1960. 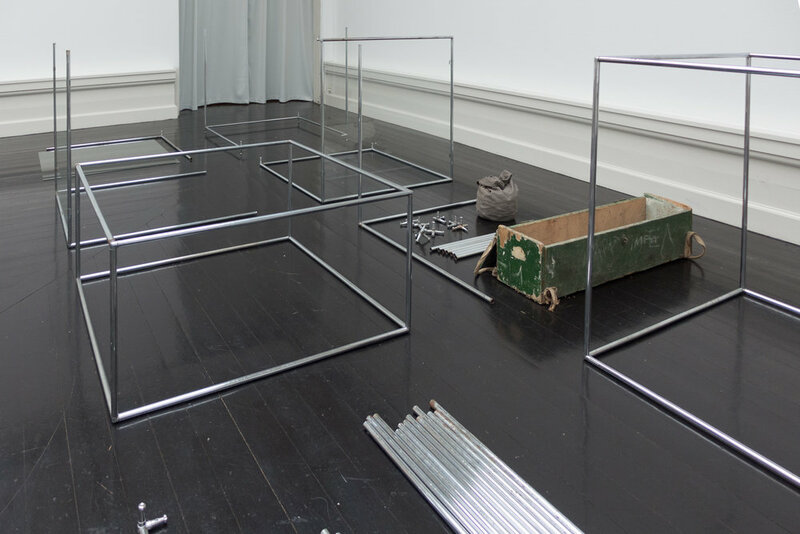 It was a modular system with metal tubing connected by knuckled joints to form cubes of different sizes to create a flexible display system for exhibitions. The joints were the key to the system - each with up to six prongs in eight different shapes. Cadovius even used scaled up frames to construct geodesic-style domes that were used at the Copenhagen Furniture Fair in 1961. A module of the system is in the collection of the Museum of Modern Art - donated by the business man Charles Mauro after he negotiated with Cadovius to manufacture and sell the tubing and the links or joins in the USA. In 2006, when travelling through the countries of the former Yugoslavia, the Danish artist Kasper Akhøj was intrigued by what seemed to be an almost ubiquitous display system surviving in shops and department stores but also used on the street for market stalls. Then, and on subsequent trips over the following twelve years, he pieced together the story of how the Danish system was produced first in China and sold to the Yugoslavian state and then was manufactured in various forms in Yugoslavia … the spread of the system reflecting the complex political situation and an uneasy relationship with the concept and then the reality of consumerism in a communist political system. Akhøj acquired pieces and their packaging and part of the collection was on show at Den Frie.